Being a history research graduate has a lot of perks – we get to discuss subjects that some might think of as frivolous, we get to pursue our academic interests in an environment where you are supported rather than laughed at (“you’re doing a thesis on corsets, how will that help you get a job?” I had someone ask me once), and well, there are those student discounts. However, if I had to say what I thought the biggest perk of being a historian was, it’s the documents and the artefacts that we get to view, read and handle. Documents that very few others could ever dream of getting their hands on. It is a little known fact that the University of Sydney has quite an extensive collection of manuscripts and printed works from the medieval and early modern periods in our Rare Books Library. We have the oldest surviving printed European Torah in our collection, we have medieval music books and we also have one of the largest collections of early modern books on demonology, witchcraft and Grimoires. In this collection we also, randomly, have a household accounts book that dates to the year 1675 and I had the pleasure of studying it in a coursework subject as part of my honours year. This however is no ordinary accounts book. It was an accounts book that belonged to a very well well known English Countess of the Elizabethan and Jacobean eras, Lady Anne Clifford, Countess of Dorset, Pembroke and Montgomery. If you are interested in late Elizabethan and seventeenth century English history, and in particular women’s history during this period, you may have heard of Anne before, in fact, she has been written about many times. This is mainly due to the fact that many of the diaries and letters she wrote during her life have survived, allowing us to take a glimpse into the sometimes very private life of an English noblewoman during the sixteenth and seventeenth centuries in England. This accounts book is also significant as it provides a glimpse into the running of a seventeenth century English estate. It covers the span one year, gives details for household expenses, wages paid and Anne’s private purse. Anne Clifford was born at Skipton Castle in Yorkshire on 30th January, 1590. She was the only surviving child of George Clifford, 3rd Early of Cumberland and Lady Margaret Russell who was the daughter of Francis Russell, 2nd Earl of Bedford. 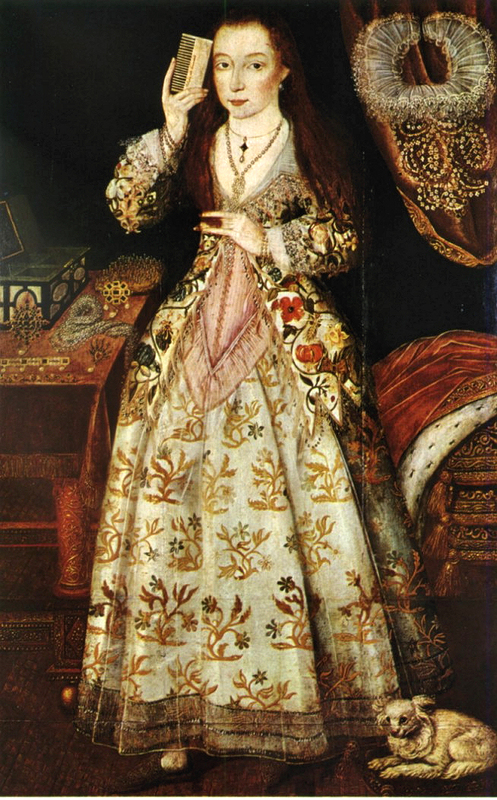 As a child she was tutored by the poet Samuel Daniel and she was a favourite of Queen Elizabeth I. When she was 15 her father died and left all their estates to his brother, Francis Clifford, 4th Earl of Cumberland. From that moment on and for most of her life she was involved in a struggle to regain her family’s properties which she deemed to be her rightful inheritance. 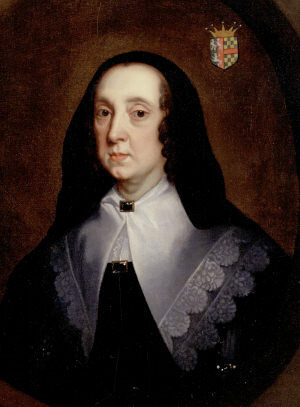 It wasn’t until her Francis Clifford only son Henry died without an heir in 1643 that she managed to secure the estate. By that time she was 53 and had been married twice. First to Richard Sackville, 3rd Earl of Dorset in 1609, two whom she had five children (all three of her sons died). After her first husband’s death in 1624 she later went on to marry Philip Herbert, Earl of Pembroke and Montgomery in 1630. Brougham Castle in located in near the city of Penrith in Cumbria. It was founded in the 13th century by the Norman Robert de Vieuxpont on the site of a Roman fort and at this time it entertained Edward I(Longshanks). Brougham castle’s usefulness diminished after medieval times and by the time it came into the hands of Anne Clifford’s father, George, it was in quite a state of disrepair. After his death in 1605, and all his estates had been willed to his brother Francis, Anne’s mother Margaret managed to hold onto Brougham castle and started repair work to it. Therefore, Anne spent most of her childhood here. However in 1617 the King granted that Francis was the rightful owner. During the time that it was in Francis’ hands, it entertained James I at an estimated cost of £1,200. It also entertained Charles I in 1629. The castle again fell into a state of neglect until Anne Clifford finally inherited her estates, however she did not live in it for another six years as the English Civil War was raging and the castle was garrisoned by Cavalier forces. By 1650, after the Civil war had ended, Anne began repairs on the castle. Repairs were mostly complete by 1653, but continued for several years afterwards, the work costing an estimated £40,000. 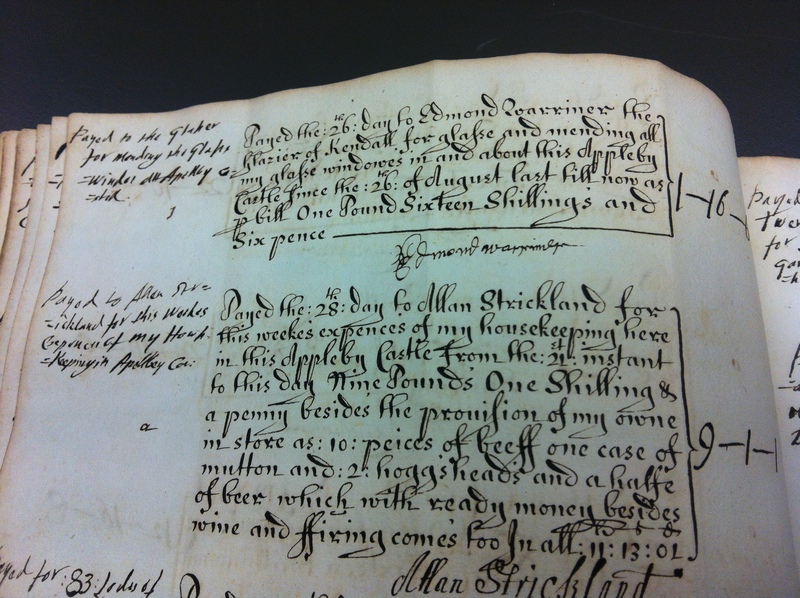 During her time in the castle in which she made it her country retreat, Lady Anne not only restored much of the castle’s structure, but also the way of life associated with living in a castle, something which is evident from this accounts book which details wages paid, etc. After her death the castle passed to the Earls of Thanet, when it again fell into a state of disrepair. In 1691 Brougham was partially demolished and finally in 1714, any materials that could be used at the castle were sold off. 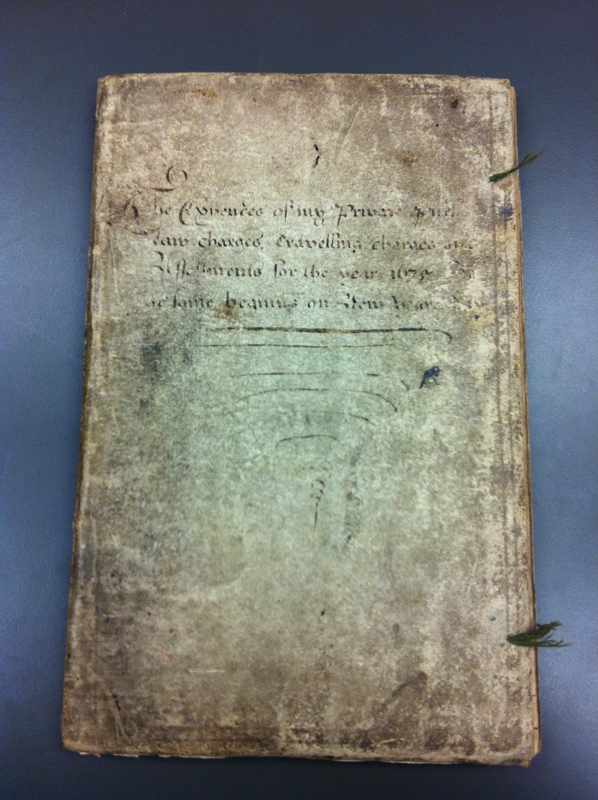 The manuscript is plainly bound in vellum. There once was a ribbon attached to tie the covers together and there also used to be red gilding on the pages of the book but this has deteriorated. For its age the book is surprisingly in good condition even though the bind has deteriorated in some places, and some of the pages are falling out . In the past someone in their wisdom had the idea of sticking newspaper between some of pages. 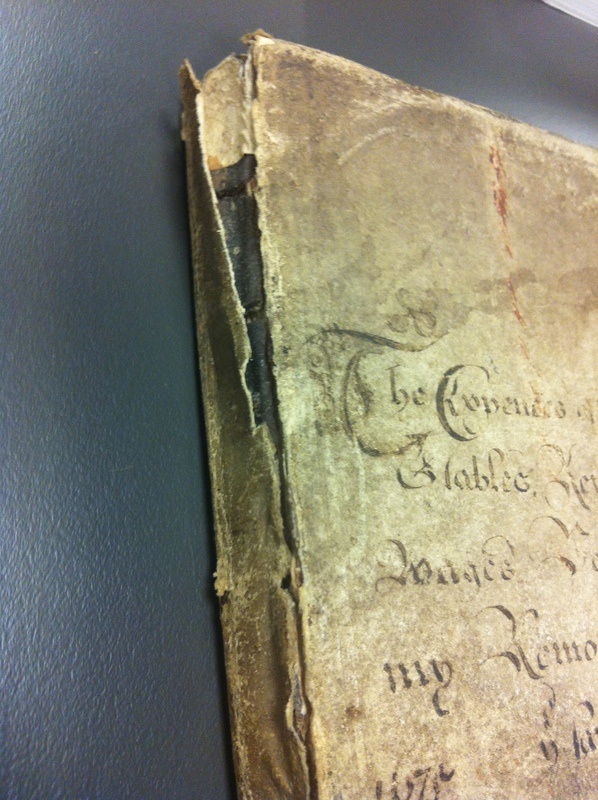 As a result this became stuck to the original manuscript in places. There are two main sets of handwriting in the manuscript. 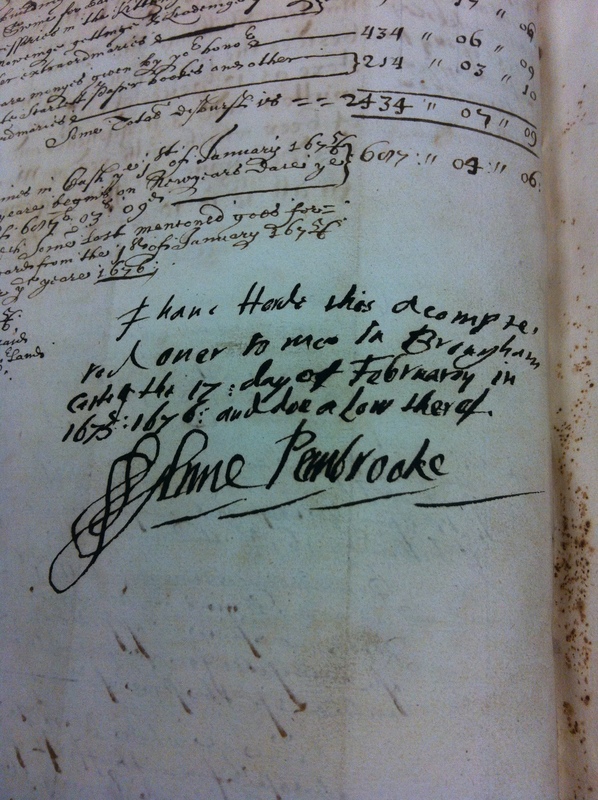 Anne’s in the margins is in scrawly italic script, which looks quite out of place compared to the stylised late seventeenth handwriting of the other person who’s handwriting I could identify: Edward Hazell, Anne’s Steward. Sir Edward Hasell, born 27/11/1642 in Hildersham, Cambridgeshire. Upon the death of his parents, Edward went to live with his uncle Bishop Rainbow in Cumbria. He was appointed steward (chief secretary) of Lady Anne Clifford in 1668, a position which he maintained until her death in 1676. Upon her death, he was left a large bequest, and using this be purchased Dalemain House in Cumberlandshire in 1680. From there on be became M.P. for the county, and high Sheriff in 1682. He was knighted by William III in 1682 and is listed as helping Wiliam III with his war against France. He died 12/9/1717. Other pieces of handwriting in the book are those of the servants and people employed at the castle. As they were paid and this was recorded, they were asked to provide their ‘mark’ as proof of payment. Some people’s marks consisted of their signature, for the others who could not write it is simply noted ” ___ ___’s mark’. Surprisingly most of the servants in the household could sign their name, indicating that they must have been literate to some degree. The book is split into two halves, each starting from the different covers. The first section, which I will not discuss in this post, contains the household expenditures of Brougham castle in the year 1675, whilst the other contains Anne’s personal expenses. By the time this private purse was written Lady Anne Clifford was well into her eighties. As a result, her personal expenditure on items like clothing or luxury goods is minimal. However, the contents of this section are still very useful in telling us how Anne spent her last year before she died. To get an idea of how much Anne was spending in the equivalent modern currency, I used to website Measuring Worth to find out. As there is no one way to exactly measure the worth of things in the past, as different people and contexts produced a variety of prices for similar items, the Measuring Worth website gives two main indications: RPI, or a Commodity which indicates the present worth of buying an item in terms of spending, and GDP, which calculates how affordable something was based on the average wage or average earnings at the time. Many of the entries are about money given to people who had provided a service for the Countess. For example she paid the “chaplan for preaching a good sermon”, and gave payment to men who had fetched things for her. However, there are many personal entries that reveal more about the Countess’ personal life. For example, one of the most interesting entries in the section is one that states, “Paid George Goodgion for clipping off all the haires of my head in my chamber at this Brougham castle which I had not done since the 24th September last…” This entry is recorded on the 20th day of October, so not only can we gather how often the countess had a haircut, but who gave it to her and how much she paid him (6 shillings or £38.20 in today’s currency). On a different occasion she also paid George “ffour shillings” for bringing her “a pound of Virginia tobacco”. So we can also gather that she smoked and that this pound of tobacco cost around £25.50 in today’s currency. For the historian of material culture the best thing about this private purse is that it allows us to see the value of things in the past. For example, two ” ffushion sheets” purchased from the tailor Emannell Jackson for the Countess’ bed cost 2 shillings / £12.70 today. Whilst two pairs of sleeves (I assume for a gown) cost the Countess 4 shillings and 6 pence / £28.60 today, and 14 yards of bone lace cost 5 shillings and 9 pence / £36.60 today. It is only by looking at these sorts of figures that you can begin to understand why only the aristocratic classes could afford such exquisite clothing in the past, if three yards of this fabric cost £573 imagine how much a whole tailored dress was, especially since 8 yards of the plain serge fabric mentioned above cost the same as only one metre of this scarlet fabric. Roughly speaking if a gown used 8 yards of fabric, just the fabric alone for one dress using this scarlet cloth would cost a whopping £1530 in today’s currency (8 x 1 pound:10 shillings per yard, with 20 shillings to a pound = £12 / 8 yards of fabric)!!! That’s over $3000 US/AU for one dress! However it appears that this fabric wasn’t for personal use as in the margins we learn that the Countess did not intend to keep this cloth as she has remarked “payed for 3 yards of scarlet clothe to give away”. By the end of her life it appears that the countess must have been very charitable as many of the items listed were intended as gifts. One entry states that she “Payed the 13th day to George Goodgion for 30 bookes of devotion hee bought me at Penrith for severall sortes, and different rates which I intend to give away to my servants…” She also gave Robert Bartion (who she has referred to in the margins as ‘Doctor Barton’?) 5 shillings “to buy him a pair of gloves”. This is the equivalent to £31.80 today. 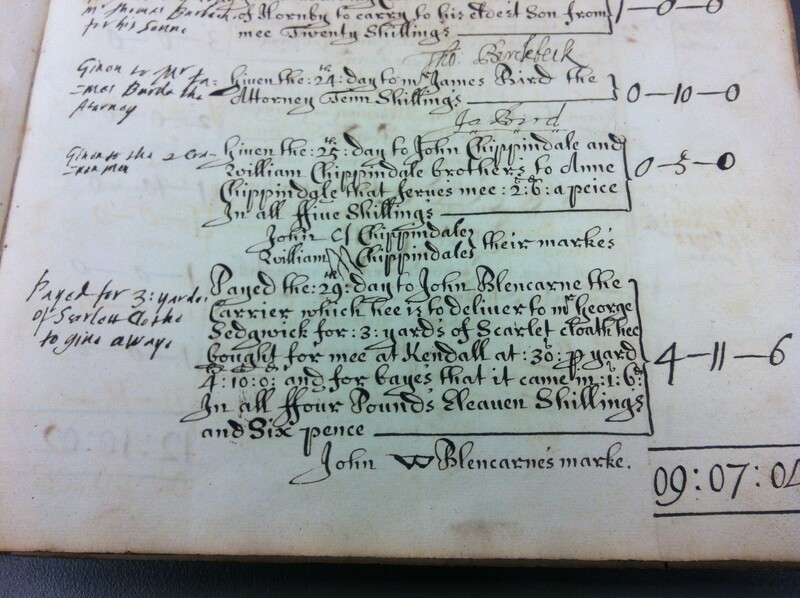 Anne Clifford died in Brougham castle in the same room as her father was born in, on the 22nd March 1676, at the age of 86 – only one year after this accounts book is dated. As a result this accounts book must be one of the last ones ever completed for Brougham castle when it was under Anne’s ownership. What I’ve talked about in this post is just skimming the surface of the amazing information that this manuscript contains, and provides a fascinating glimpse into the everyday life of not only a famous figure in English history, but into the everyday lives of those ordinary people who worked in her estates. Ninya Mikaila and Jane Malcolm-Davies, The Tudor tailor: Reconstructing 16th-century Dress (London: Batsford, 2006), p. 37. Mikaila and Malcolm-Davies, The Tudor tailor, p. 36.. The first reconstruction that I will be making is the effigy bodies of Queen Elizabeth I that are now on display in Westminster Abbey in London. These bodies were specially constructed, probably by the Queen’s tailor William Jones, upon the death of Elizabeth in 1603, for the effigy that would accompany her body to its resting place in Westminster Abbey. As Janet Arnold notes, it is therefore unlikely that the Queen ever wore these bodies, however, their size and construction was probably based on the bodies that Jones had previously made for the Queen. Regardless of whether the Queen really did wear them or not, they are the second oldest pair of bodies in Europe that are known to have survived (the earliest surviving bodies were found on the corpse of Pfalzgräfin Dorothea Sabina von Neuburg, who was buried in what is now Germany in 1598), and the certainly oldest English pair that we know of. The pattern I’m using for my reconstruction is one that the amazing Janet Arnold made of the bodies when she studied them in 1994, which was then published posthumously in the journal of Costume. The effigy bodies consist of three separate parts: two front sections that lace together with twenty-nine eyelet holes and a back section. The lining consists of four parts (the back panel lining being divided into two sections). There are a total of six tabs that spread over the hips, two on the back piece and two on each front section. From the pictures and the pattern provided I’m unsure as to whether the shoulder straps are part of the back section, or are attached separately. Arnold’s pattern has them as separate from the back piece, however, in the pictures and other sketches of the bodies they appear to cut into the back piece. My intention is the make the bodies exactly the same size as the original pair in Westminster Abbey, which by my calculations means that Elizabeth I had a 21” waist (!!). 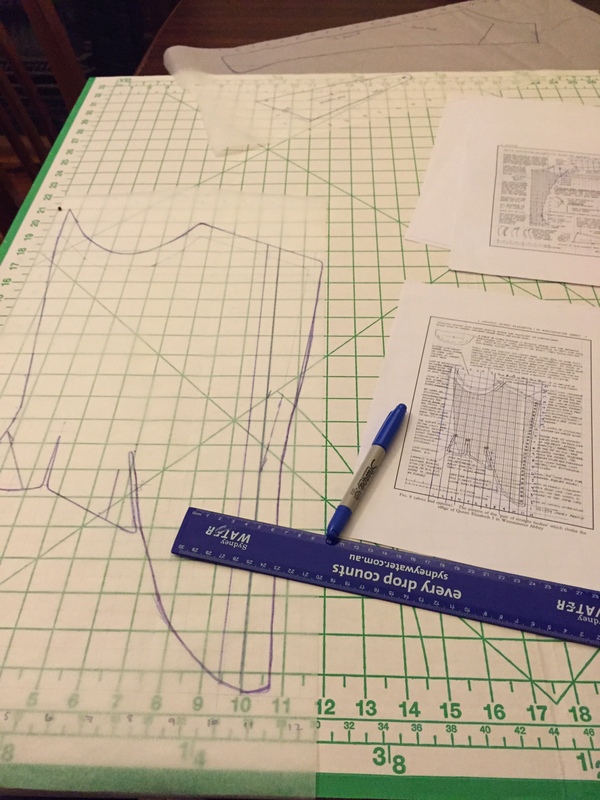 A disclaimer at the start of the article states that “Janet’s full-scale pattern of the ‘pair of straight bodies’ has been scaled down to fit the page size of Costume.” I, however, am working off a .pdf document version of this article printed on A4 paper which may be bigger than the pages of Costume. Although technically if I copy it correctly onto a 1 inch scale it shouldn’t really matter. To double check this though, I’ve also used the pattern provided in the Tudor Tailor. Unlike the bodies mentioned in the wardrobe accounts of Elizabeth I, the effigy bodies are rather plain. They are made from two layers of twill weave fustian cloth that was originally white, are bound by green leather that had a suede finish and were stitched with linen thread. The term ‘bodies’ during this period could refer to a number of things – from the bodices of gowns, to the undergarment that is visible on Countess Elizabeth Vernon of Southampton in her portrait below, and of course to the effigy bodies. My archival research has confirmed that bodies that belonged to elites during this period were always made from materials such as silk satins and silk taffetas, sometimes even velvet, and usually lined with sarcenet, fustian, canvas or buckram. 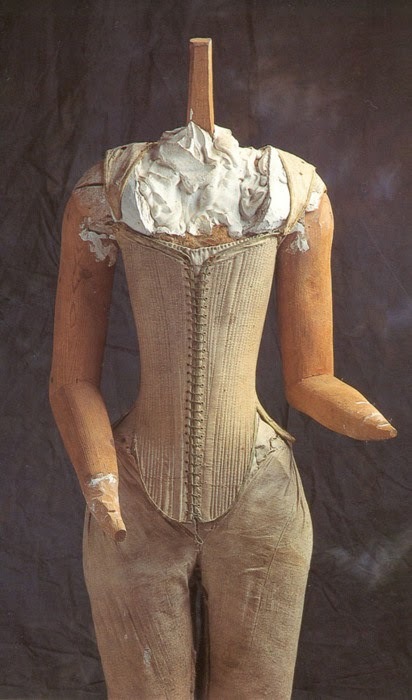 Contrary to popular opinion, bodies were not always stiffened with material such as whalebone or bents, and rarely so until the late sixteenth century. The term ‘straight bodies’ usually referred to those that were stiffened and ‘French bodies’ usually referred to those what were boned with whalebone, as the effigy bodies are. Here was a wardrobe account that not only matches the only visual image of elite bodies from the period, but was made within a close enough time period to the effigy pair that they could have been the same or a very similar style. 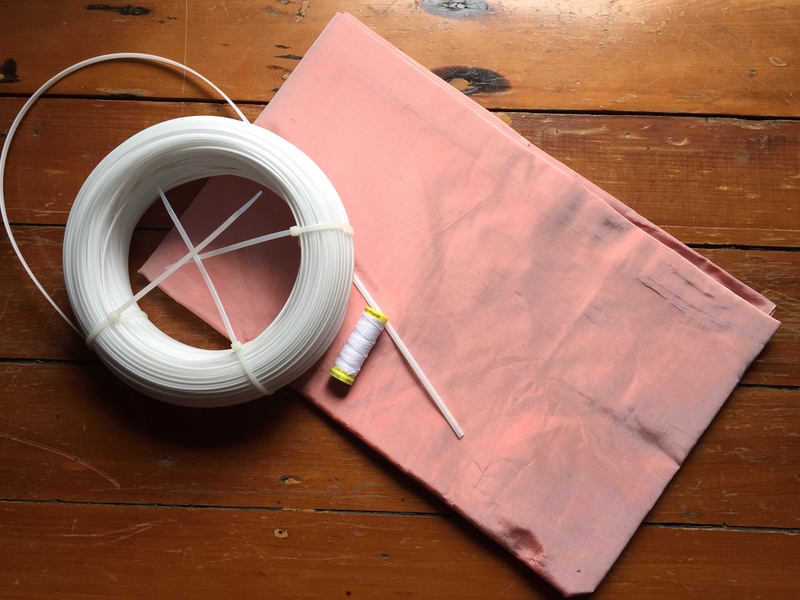 Therefore, for my reconstruction I will use a pale pink (“carnacion”) coloured silk taffeta for both the outer fabric and the lining. Although fustian and sarcenet were the fabrics most commonly used as lining in the wardrobe accounts, they are rarely used in modern clothing and so are incredibly hard and expensive to source. There are warrants from Elizabeth’s wardrobe during the same period, such as this one: “Item for makinge of a pair of bodies… of black veluett… lined with Taffata…”, that shows that taffeta was also used as lining, although less frequently. To bind the bodies I will use white faux leather which closely mimics the properties of leather and is easy to source. The 1603 effigy bodies are completely boned with whalebone and the average width of this boning is 6mm, except for two 12.7mm wide pieces on either side of the front opening. As whalebone (‘baleen’) is, for good reason, not available anymore I will have to use an somehing else. A period alternative would be small bundles of bents (a thin reed), like those used in Hilary Davidson’s modern reconstruction of a sixteenth-century Spanish pair of bodies. However, as the effigy bodies contained whalebone I will use a modern alternative that mimics baleen’s properties. I have chosen modern plastic dress making boning. It is similar in width to the original whalebone (5mm) and contains the same amount of flexibility as traditional whalebone. Although silk bodies probably would have been constructed with a mixture of silk and linen thread, as costs must be considered in my reconstruction, I will use only linen thread to hand construct the bodies and to work the eyelet holes so they don’t fray (similar to the way that modern button holes are done). 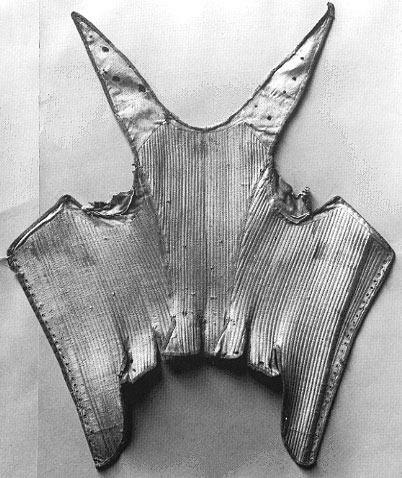 Janet Arnold, ‘The ‘pair of straight bodies’ and ‘a pair of drawers’ dating from 1603 which Clothe the Effigy of Queen Elizabeth I in Westminster Abbey’, Costume, Vol. 41 (2007), p. 1. Arnold, ‘The ‘pair of straight bodies’, p. 1; Luca Costigliolo, ‘From Straight bodies to Stays’, Seventeenth Century Women’s Dress Patterns: Book Two, Susan North and Jenny Tiramani, eds. (London, V&A Publishing, 2012), p. 10. Arnold, ‘The ‘pair of straight bodies’, pp. 1, 3; Luca Costigliolo, ‘From Straight bodies to Stays’, p. 10. Elizabeth I Warrant for the Robes, 18 May 1590, ER 32 (PRO LC 5/36), fol. 133. Elizabeth I Warrant for the Robes, 28 September 1592, ER 34 (PRO LC 5/36), fol. 251. Arnold, ‘The ‘pair of straight bodies’, p. 3. Hilary Davidson and Anna Hodson, ‘Joining forces: the intersection of two replica Garments’, Textiles And Text: Re-Establishing The Links Between Archival And Object-Based Research, [postprints], eds. M. Hayward and E.Kramer, (London: Archetype, 2007), pp. 206-108.